The Australian Centre for the Moving Image (ACMI)'s fun and free Family Sundays event returns on the first weekend of September, with a theme dedicated to storytelling. Falling on Sunday 3 September, which this year happens to be Father's Day, ACMI’s Family Sundays: Smart Stories encourages families to enjoy Melbourne's first class museum and gallery space for the day. Australian artist, writer and film maker Shaun Tan will be attending the event, and will speak to audiences from the ACMI Lightwell stage. For creative kids, there's an opportunity to craft a comic book or graphic novel and turn their family members into superheroes for the day. Otherwise, families can have a go at their own choose-your-own adventure style narrative with Twine. Visitors are encouraged to write and animate their own simple storybook adventure with hand-drawn images and iPads. 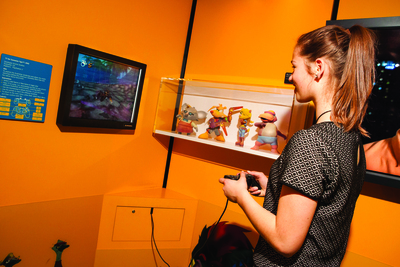 There will be interactive storytelling sessions where kids can discover their "inner monster" and lastly, a range of narrative based video games to enjoy in ACMI’s Games Lab. All of the above activities are completely free. Also note if you can't make it on Sunday 3 September, the next ACMI Family Sundays event will be on Sunday 1 October with theme of Journey Into Outer Space.